The lowdown on phosphorus levels…on this CurrentCast. Mussels are great water filters, but too many can do more harm than good. 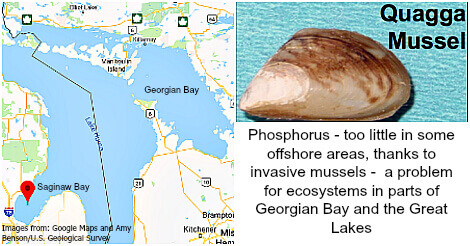 Excess phosphorus is a problem in many parts of the great lakes. But in Saginaw bay, invasive mussels are removing so much that there’s not enough making its way to the deep waters of Lake Huron. Fewer phytoplankton means less food for small fish and ultimately larger fish too, like salmon and lake trout. So while too much phosphorus is a problem, too little is also a low blow for the ecosystem. ← Baby Beluga in the Deep Blue…River?